4G Americas Scenario Shows Mobile Data Growth Tapering Off « Steven J. Crowley, P.E. 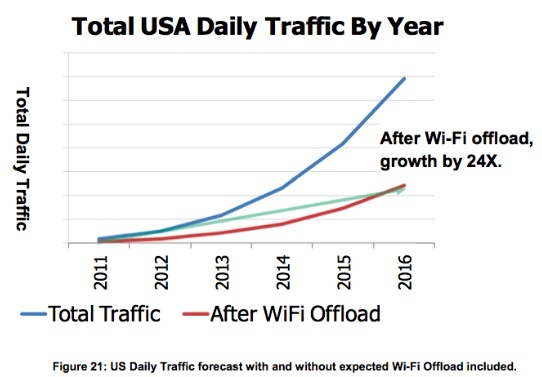 On offload, 4G Americas says Wi-Fi offload of mobile traffic is at 35% today in the U.S., and is estimated to be 68% by 2016. There’s no source for these numbers, such estimates can vary, but these figures are reasonable. Absent is a similar consideration of femtocell offload, but it can be expected to be smaller than that for Wi-Fi up to 2016, at least. Cisco’s VNI data on global mobile data traffic (Figure 23), which makes no distinction between historical and forecasted data, yields vastly different projections depending upon how much of the historical record is included in the fit. The following graphic shows the impact of selecting pre-2012 data points (in blue) and including Cisco’s own forecast to 2015. We see, then, that we live in a critical time, when the wireless data explosion is upon us, but its further outlines are only hinted at in current data. Careful analysis of the traffic statistics in the coming quarters may reveal the 2015 and 2020 expectations or perhaps see the unleashing of further pent-up demand. So, 4G Americas apparently combines measured results pre-2012, and Cisco VNI data for 2012 and beyond, then fits a logistic curve (sometimes called an S-curve) to these data, which shows global growth “saturating” around 2020 at about 13 exabytes per month. The “critical time” refers to us possibly being at an inflection on the curve. We might be there because the year-to-year growth of Cisco’s forecast is decreasing. (Put another way, the percentage increase is smaller each year.) I suggested this is what is happening in a blog post last November. For anyone skeptical, look at any Cisco VNI forecast and calculate the year-to-year percentage increases. The blue curve shows the infamous “exponential growth” curve, which continues to be invoked as a spectrum bogeyman, especially in the U.S; as you can see, no way. 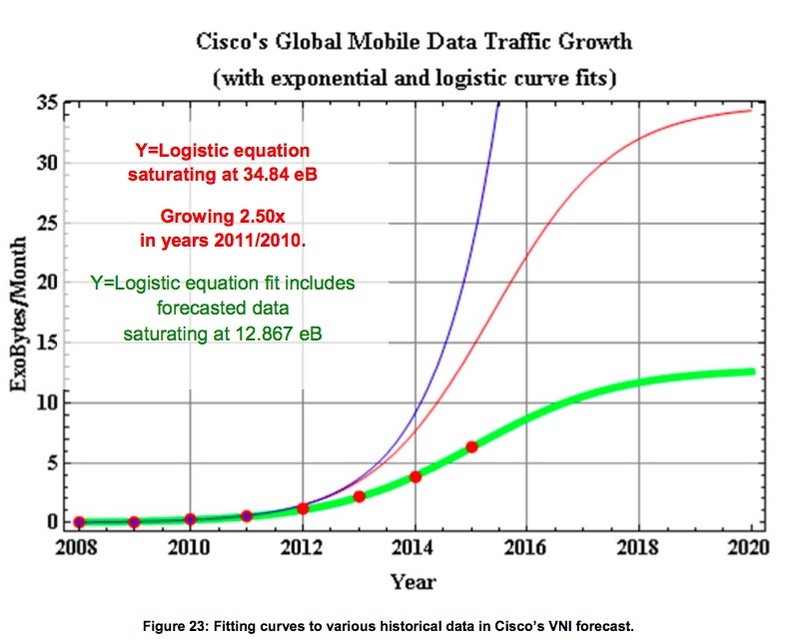 The red curve is a logistic curve fit to a 2.5x growth rate, which appears high compared to the green curve fitted to Cisco data. This is just one scenario. Perhaps, as 4G America’s suggests, there will be an “unleashing of further pent-up demand.” We don’t know what’s going to happen, but this result is consistent with the transformation of mobile networks from macrocell-only to heterogeneous — bringing the user closer to the “base station,” which will increasingly be a small cell indoors because that’s where we are most of the time. When this happens, the user is offloaded from the macrocell, and demand on the macrocell is decreased. We’ll be using ever-increasing amounts of data, but it will be accessed more efficiently, with smaller percentages from macrocells. Regardless, this projection should not slow efforts to make spectrum policy more rational and spectrum use more flexible. This entry was posted on Wednesday, May 16th, 2012 at 11:00 pm and is filed under 3G, 3GPP, 4G, Femtocells, HSPA, LTE, Mobile Broadband, Mobile Services, Small Cells, Spectrum, Wi-Fi. You can follow any responses to this entry through the RSS 2.0 feed. You can leave a response, or trackback from your own site.